Architect G. W. Laine designed this magnificent Carpenter Gothic structure for Norman Dodge. It was repaired after the hurricane of 1897. 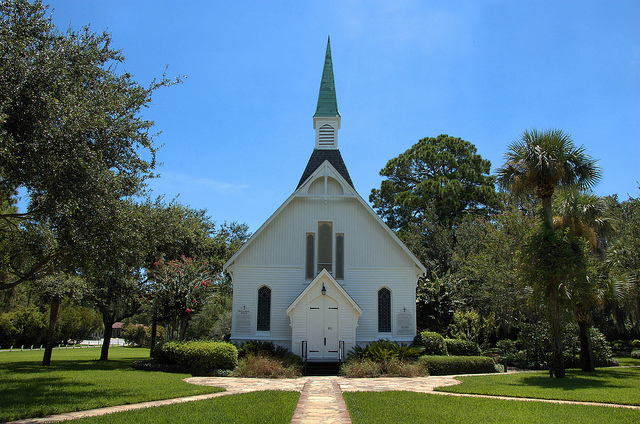 It was first known as Union Church and later home to St. James Episcopal. It was moved to its present location in 1911, after having fallen out of use. Reconsecrated by the Methodists in 1949, it was given the name Lovely Lane in honor of the 1774 church which was the site of the founding conference of Methodism in Baltimore in 1784. It’s used for baptisms, weddings, worship and meditation today, by locals and visitors who come to Epworth By The Sea from all over the world.